#MeToo shone at the Grammys and Davos, but was it just lip service? At this year’s World Economic Forum in Davos, the #MeToo movement had a place at the table. Not only were all seven co-chairs women, but also at least one panel was dedicated to addressing #MeToo. The discussion featured a rousing moment when Peggy Johnson, an executive vice president at Microsoft, noted that whereas earlier in her career she felt she had to laugh along at inappropriate jokes cracked by men in the workplace, now she takes it seriously — as does her daughter, a newcomer in the tech field. On one hand, it makes sense that great minds in power would come together at Davos to tackle the longstanding yet increasingly urgent problem of sexual misconduct in the workplace. But is the WEF just giving an obligatory nod to a zeitgeist-y issue? After all, Davos is so famously a boys' club that political scientist Samuel P. Huntington coined the term “Davos Man” to describe the global elite that attend this swanky summit in the Swiss Alpine resort. 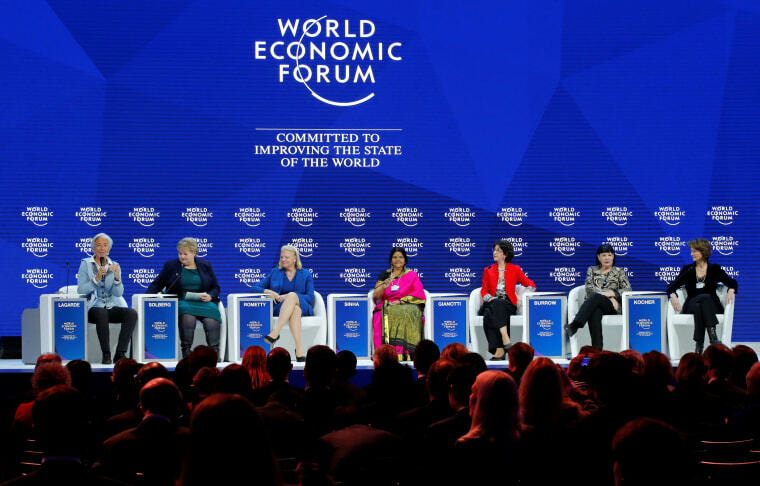 Sure, you can be a Davos Woman, but you don’t hear that as much, and why would you? Even in 2018, only 21 percent of the conference’s attendees were women. With that bleak number in mind, we must ask: Can real progress come out of this ostensibly watershed woman’s moment at Davos? And what would that even look like? One of the reason Harris has doubts is in fact one of the very reasons Davos seemed so progressive this year: the all-women co-chairs. Avery Blank, a women's leadership expert, strategy consultant, and World Economic Forum agenda contributor adds that while she also isn’t a fan of all-men or all-women committees, she actually found that in this case, the move was important. “The time is now. Having all women chairs is a way to call attention to the power imbalance and reset the balance of power,” said Blank. A more concerning point of skepticism Harris points to is in the WEF’s own data. The forum’s Global Gender Gap Report 2017 found that the gender gap widened in 2017, and that the U.S fell from 45 to 49 among the 144 countries ranked. As long as women make less than men, they have less power and more to lose. In such a world, the problem of harassment in the workplace can only persist. There is a way to make this pipe dream a reality, but it’s something that every company must commit to changing from within. That likely won’t be easy because it will require some possibly painful self-examination and re-assessing of values. “CEOs need to look in their own backyard and ask, ‘What is our culture like here?’ Everyone is aware that #metoo is happening and it’s a problem, but they don't necessarily think of their own [workplace],” said Terri Boyer, founding director of the Anne Welsh McNulty Institute for Women’s Leadership at Villanova University. This entails assembling data and being perfectly transparent about whatever you dig up regarding gender inequalities, lack of diversity in leadership, and any other skeletons in the C-suite closet. And this data ought not to be just a compilation of numbers on a spreadsheet, but the documentation of first-person experiences shared by all people in your company. Another point where organizations often fail is in valuing the work and stories of the people who are paid the least — and in enabling them to share their experiences with dignity, respect, and protection. Instead of focusing on only the top-level leaders, why not tap the minds of people below or at least outside the executive realm? Shelley Zalis, CEO and founder of The Female Quotient thinks such consideration could quickly escalate that 21 percent of women attendees to a healthier number.